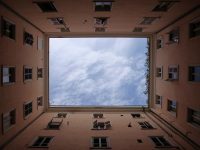 In this article, Michael looks at how to maximize the performance of your cloud database Amazon RDS deployment. He shows that you can enhance performance by using ProxySQL to handle load balancing and Percona Monitoring and Management to look at performance metrics. Percona is an Advanced AWS Partner and provides support and managed cloud database services for AWS RDS and Amazon Aurora. Check the article it out! While DBaaS encapsulates a lot of the moving pieces, it also means relying on this approach for your long-term stability. 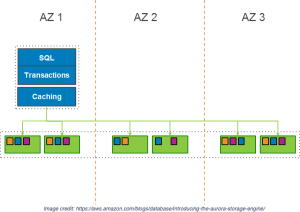 This encapsulation is a two-edged sword that takes away your visibility into performance outside of the service layer. Bad queries are one of the top offenders of downtime. Aurora doesn’t protect you against them. Performing a query review as part of a routine health check of your workload helps ensure that you do not miss looming issues. It also helps you predict the workload on specific times and events. For example, if you already know your top three queries tend to exponentially increase, and are read bound, you can easily decide to increase the number of read-replicas on your cluster. Having historical query performance data helps makes this task easier and less stressful. 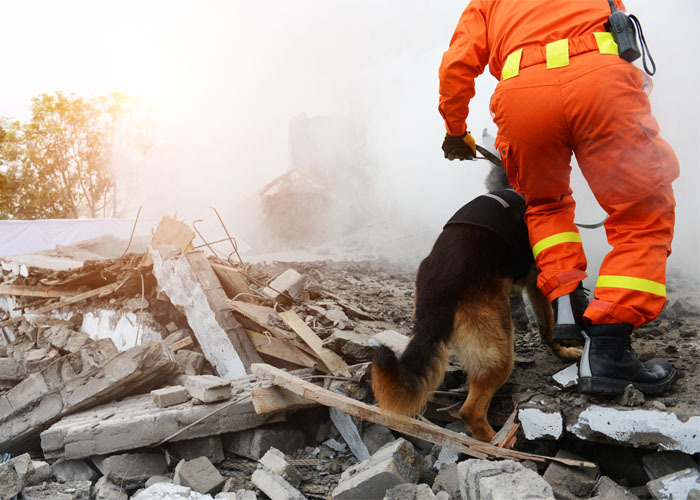 While historical data allows you to look backward, it’s also very valuable to have a tool that lets you look at active incident scenarios in progress. Knowing what queries are currently running when suffering from performance issues reduces guesswork and helps solve problems faster. There are a number of ways you can achieve query performance excellence. Performance Insights is a built-in offering from AWS that is tightly integrated with RDS. It has a seven-day free retention period, with an extra cost beyond that. It is available for each instance in a cluster. Performance Insights takes most of its metrics from the Performance_Schema. 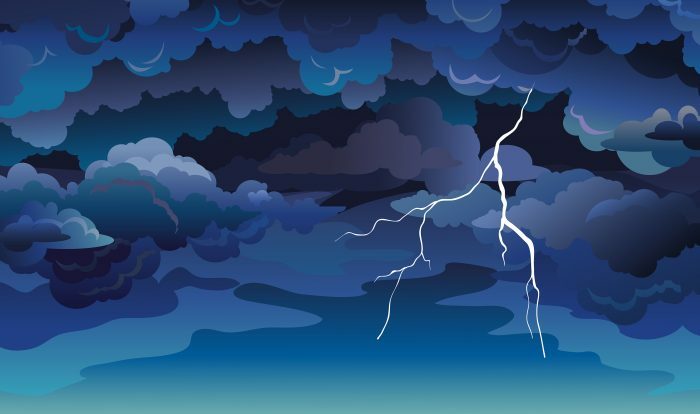 It includes specific metrics from the operating system that may not be available from regular Cloudwatch metrics. Query Analytics from Percona Monitoring and Management (PMM) also uses the same source as Performance Insights: the Performance Schema. Unlike Performance Insights though, PMM is deployed separately from the cluster. This means you can keep your metrics even if you keep recycling your cluster instances. With PMM, you can also consolidate your query reviews from a single location, and you can monitor your cluster instances from the same location – including an extensive list of performance metrics. You can enable Performance Insights and configure for the default seven-day retention period, and then combine with PMM for longer retention period across all your cluster instances. Note though that PMM may incur a cost for additional API calls to retrieve performance insight metrics. Outside of the built-in and open source alternative, VividCortex, NewRelic and Datadog are excellent tools that do everything we discussed above and more. NewRelic, for example, allows you to take a good view of the database, application and external requests timing. This, in my opinion, is so very valuable. Bad queries are not only the potential unknowns. Deleted rows, dropped tables, crippling schema changes, and even AZ/Region failures are realities in the cloud. We will discuss them next! 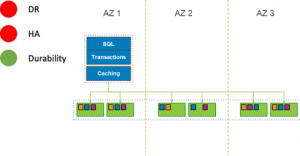 Stay “tuned” for part two: Migrating to Amazon Aurora: Optimize for Binary Log Replication. Are you using a fully managed service or are you self-managing your databases in the cloud? And what provider are you relying on? Perhaps you’re using more than one. Don’t worry, you can tick multiple boxes, so please choose up to four answers. If you don’t see your solution listed, use the comments box on this blog to feedback your thoughts. If you’d like to, you’re also welcome leave a comment to tell us about your choice—or maybe why you’re NOT planning on moving to a cloud solution in the near future. 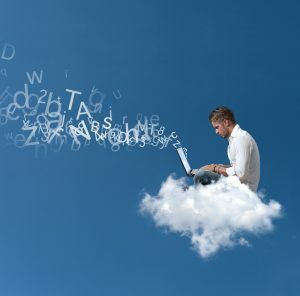 Likewise if you want to share how you’ve found your cloud deployment so far, feel free to send a comment. Thanks! 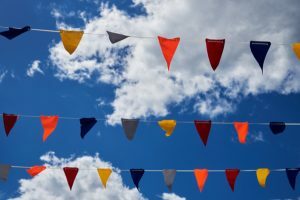 The post Percona Blog Poll: How Do You Run Your Database in the Cloud? 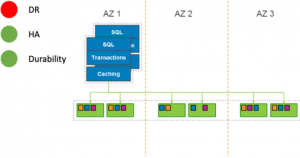 appeared first on Percona Database Performance Blog. The post Taboola and Percona Host a Meetup in Tel Aviv, Oct 3 appeared first on Percona Database Performance Blog. To recap, in Amazon EC2 we can use gp2 and io1 volumes. gp2 performance can be scaled with size, i.e for gp2 volume size of 500GB we get 1500 iops; size 1000GB – 3000 iops; and for 3334GB – 10000 iops (maximal possible value). For io1 volumes we can “buy” throughput up to 30000 iops. 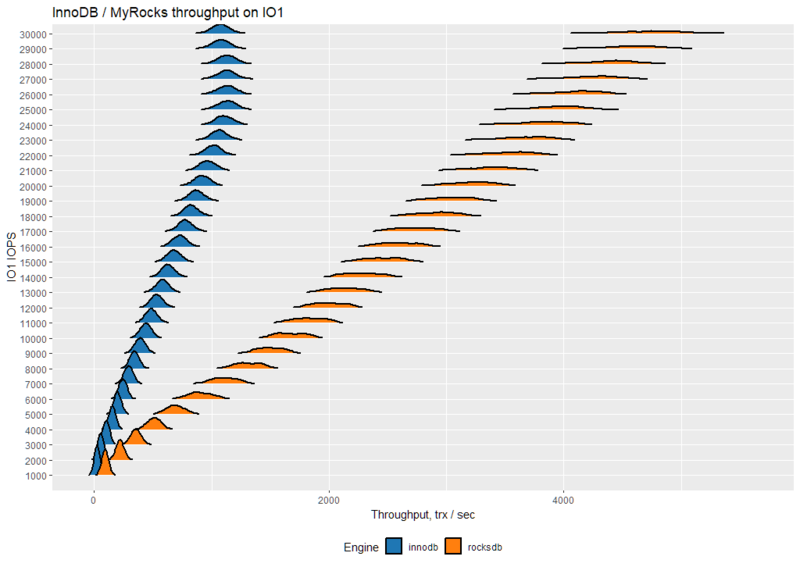 So I wanted to check how both InnoDB and RocksDB storage engines perform on these volumes with different throughput. I will use the same datasize that I used in Saving With MyRocks in The Cloud, that is sysbench-tpcc, 50 tables, 100W each, about 500GB datasize in InnoDB and 100GB in RocksDB (compressed with LZ4). Volumes settings: gp2 volumes from 500GB (1000GB for InnoDB) to 3400GB with 100GB increments (so each increment increases throughput by 300 iops); io1 volumes: 1TB in size, iops from 1000 to 30000 with 1000 increments. Let’s take look at the results. I will use a slightly different format than usual, but hopefully it represents the results better. You will see density throughout the plots—a higher and narrower chart represents less variance in the throughput. The plot represents the distribution of the throughput. It’s quite interesting to see how the result scales with better IO throughput. 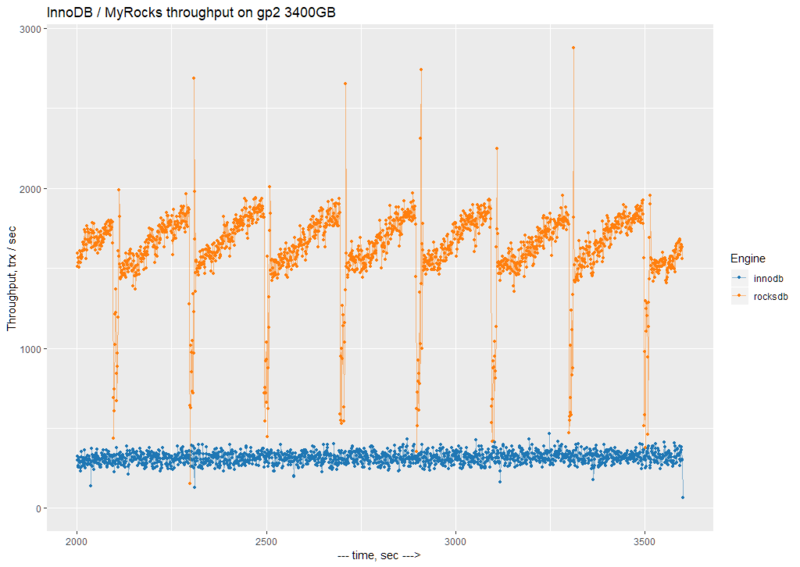 InnoDB does not improve its throughput after gp2 size 2600GB, while MyRocks continues to scale linearly. 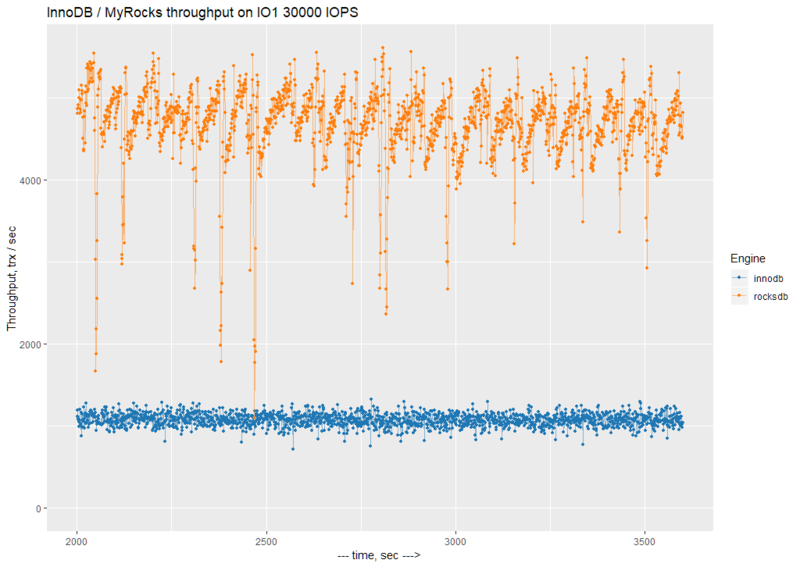 The problem with MyRocks is that there is a lot of variance in throughput (I will show a one second resolution chart). Here MyRocks again shows an impressive growth as as we add more IO capacity, but also shows a lot of variance on high capacity volumes. So for MyRocks there seems to be periodical background activity, which does not allow it to achieve a stable throughput. 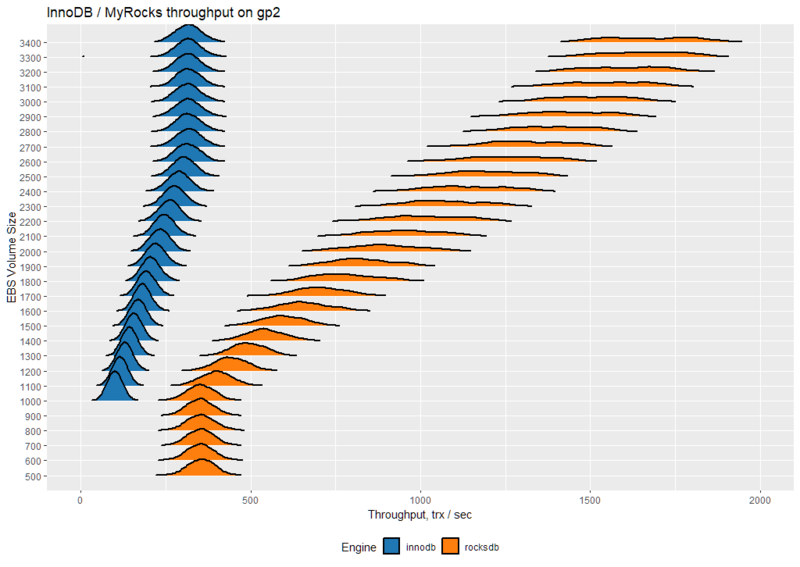 If you are looking to improve throughput in IO-bound workloads, either increasing GP2 volumes size or increasing IOPS for IO1 volumes is a valid method, especially for the MyRocks engine. 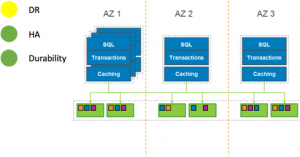 The post Scaling IO-Bound Workloads for MySQL in the Cloud appeared first on Percona Database Performance Blog.